The Malaysian Communications and Multimedia Commission (SKMM) are entrusted with the role of promoting and regulating the communications and multimedia industry and to enforce the communications and multimedia laws in Malaysia. Their primary role is to implement and promote the Government's national policy objectives for the communications and multimedia sector. 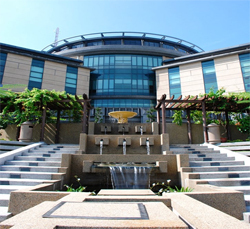 MCMC have a huge complex with multiple facilities like conference rooms, training rooms, meeting rooms etc. MCMC wanted a Facility Booking or Room Reservation system that will help to streamline the reservation and usage of common and individual facilities within a building complex or different sites. The eFACiLiTY® – Facility Booking System suits exactly to MCMC's requirements with features like Quick Booking, Advance Booking, Car Park booking, Refreshments ordering was found as the best choice by MCMC for implementation in their state of the art office complex. The eFACiLiTY® – Facility Booking System helps to manage the facility reservation operations end-to-end. The system is used for booking the training rooms, seminar, discussion and meeting rooms. Also specialized facilities like boardroom, auditoriums and other unique shared facilities are managed via the system. The implemented system uses integrated windows authentication & single–sign–on for ease of user access connecting to the MCMC's Microsoft active directory setup. The Quick Booking feature helps to book a facility in a few clicks entering very less details. The Advance Booking facility is for booking single or multiple facilities for single or multiple dates and has a comprehensive set of features capturing every nuance possible in the reservation process. Even car parks can be booked for the visitors. The facility reservation system streamlines the workflow from request to confirmation or rejection of the booking requests to cross department/organization billing. The users can also order refreshments, invite external and internal attendees via the facility booking system. The system has a unique Visual Booking interface using which the users can click on the building's floor plan and choose the particular facility or meeting room by highlighting on the floor plan. The availability, seating capacity and other information is available just on moving the mouse over the various facilities. The system also has a Visual Designer interface using which the administrator can import AutoCAD floor plans, setup the available conference rooms, meeting rooms and work spaces by dragging and dropping the icons and linking to the facilities master. This enables MCMC to setup its own visual booking interface for future expansion and do alterations as required. The billing module helps in cross department charge backs for the facility utilization.